Why should I decide for a puppy breeded in the cbp? Until our breeder has his first litter of puppies, he already had have done a lot of efforts and work. He had participated in special workshops for breeders provided by the VDH and the CBP and he hat joined frequently the meetings of the breeders of the CBP. 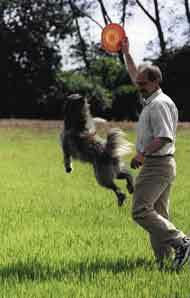 He had visited several Dog shows, to stay up to date, and of because his enthusiasm for the breed. Before the female dog can be presented for the registration as a breeding dog, she had to pass several controls of healthiness. These results and the information of the registration procedure will be integrated in the IT-based genetic calculation. After nine weeks the desired litter will fall. On average our breeders have approximately four puppies per litter. Beside of his own efforts the breeder is forced to accept some other services, for which he has to pay for: The puppies and their mother will be examined at least two times by a veterinary ( first time in the first postnatal week of the litter and the second time, when the puppies are round about seven or eight weeks old). Then the mother and the puppies have to be wormed several times and the puppies will get a pre immunization against distemper, Hepatitis contagiosa canis /´(HCC), Leptospirosis and Parvovirus; the litter will be examined by a breeding warden of the CBP and this person has to confirm that everything is done compliant to the rules of the CBP / VDH and FCI; Club Berger des Pyrénées then issues the pedigrees – these are all services which have to be accepted by the breeder and he has to pay for it. And by the way, mother and puppies need a very special feeding. But all this is compensated by having the special experience to see out little Bergers growing up and knowing that the new owners will appreciate all this efforts.